The 2009 Giant FCR 2 W (above, as seen at Interbike) is a flat-bar women’s road bike that will make workouts and errands fun, fast, and yet still comfortable. Lovely: Its custom white and pink color scheme. 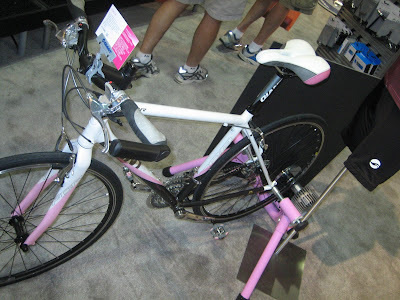 Even lovelier: Giant for Women is a proud sponsor of the Young Survival Coalition (YSC) and the Hershey’s Tour de Pink, a multi-day ride to raise funds and awareness for young women who have been diagnosed with breast cancer. From the Giant catalog: "A lightweight aluminum frame and Compact Road Design geometry give the FCR road-racing credentials, but it's outfitted with a flat handlebar for everyday performance. On the street or on the bike path, FCR makes the miles go by. Quickly." Plus: Shimano 9-speed drivetrain, FSA Omega triple crankset, Crank Brothers Smarty pedals, Mavic CXP22 rims, Formula sealed hubs/SAPIM race spokes, wheelset.